Our culinary maven scrubs the dirt off the much-maligned beet for a healthy injection of color and taste, guaranteed to help you keep your resolve to eat light after the holidays! Beets get a bad rap, synonymous as they are with stodgy Soviet staples such as watery borshcht or the oily beet salad called vinaigrette. I wonder sometimes if beets suffer from poor product placement. Apart from that narrow window when baby beets are in season and gloriously attached to their purple stalks, beets don’t beckon. This time of year, they lurk apologetically, caked with dirt among the turnips and potatoes and other lackluster root vegetables. This is a real shame, because, apart from berries, Mother Nature doesn’t serve up anything as vibrant, versatile, or healthy as beets, a natural tonic for the liver, packed with nutrients and antioxidants. 3 Tbl of fresh tarragon, leaves removed from the stem and very finely minced. This is just what the doctor ordered to get us back on track after the long January. It’s time to tackle that New Year’s resolution to eat healthy, so this week, we’ll rescue beets from the back of the vegetable bin and re-configure a classic Russian vinaigrette into a calorie light, citrus-infused delicacy that is as good for you as it is to eat! 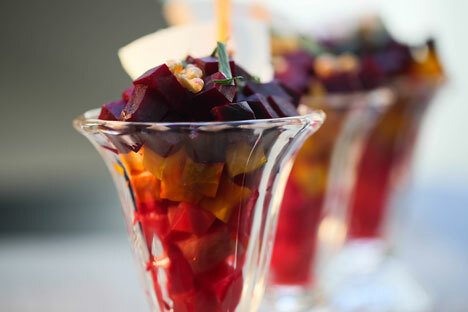 Beets come in an amazing variety of jeweled tones – I love golden yellow beets and whenever I find them, I pounce! I used yellow, red, and classic purple beets for this salad, but any combination works just as well. When buying beets, choose the smaller or medium-sized ones without any visible bruising or nicks in the skin. At the risk of inciting revolution, I am going to firmly recommend roasting the beets in a very hot oven (425°F) rather than boiling them, as most Russians do, and this is advice I encourage you to use whenever you think about beet prep. Roasting allows the natural sugar in beets to slowly caramelize and if you take the extra trouble to wrap the beets in aluminum foil, you will firmly lock in the flavor, which escapes when you boil beets. It’s a no-brainer, and you can keep roasted beets in the fridge for about 72 hours. To keep the vinaigrette light, and to compliment the natural sweetness and pungency of the beets, I combined orange juice, ginger, scallions, and tarragon into a tangy sauce in which I tossed the beets with more fresh tarragon, fresh scallions and chopped walnuts. A salty cheese such as Ricotta Salata or feta makes a nice contrast. As the slideshow demonstrates, I encourage you put on your creative hat when deciding on the aesthetics of your presentation and plating: try the parfait option for an elegant buffet dish, as a minimalist haute cuisine starter, as a robust rustic salad for a pot luck mob, or teamed with arugula for a quick midday salad. 1. Pre-heat the oven to its highest roast setting. Scrub the dirt off the beets with a vegetable brush. Wrap each beet in a casing of aluminum foil and place on a rack set into a baking sheet and roast for 45 minutes. Test for doneness by inserting the point of a small knife into the beet. 2. Mix all of the remaining ingredients except for the oil and fresh tarragon in a small saucepan. Bring to a boil and then let simmer, stirring occasionally until the mixture thickens. 3. Remove the liquid from the stove and strain using a fine mesh sieve. Cool to room temperature. 4. When the beets are done, allow them to cool completely. Peel the skin from the beets, then cut into your desired shape. Note that if you want to keep the colors separate, work in color batches, rinsing the knife and cutting board between batches to avoid staining. 5. Whisk the olive oil into the sauce, pour over the beets and toss lightly. Garnish with fresh tarragon and top with walnuts and cheese if desired. Note: This salad is incredibly versatile – I often serve it on top of quinoa during the summer, or alongside grilled meat. Experiment with your own favorite way to serve this healthy alternative! Jennifer Eremeeva is an American writer based in Moscow and the author of Lenin Lives Next Door: Marriage, Martinis, and Mayhem in Moscow, available in February, 2014.